Route is via Second Ave, Eling, Marchwood, Ipley Cross, Beaulieu Rd and B 3056 to Beaulieu then Bunkers Hill and Cripple Gate Lane to the Turf Cutters. Return is via same route, the Hythe ferry or train from Beaulieu Rd Stn. We will stop at the Bold Forester for coffee on the way out and will reach the Turfcutters in time for lunch. 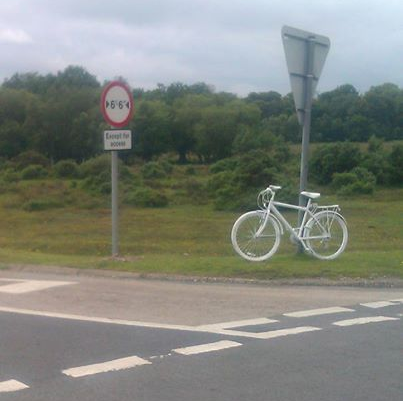 CTC cyclists will join us at Ipley Cross where we will stop for a few minutes to remember Mark. Another great, well organized ride! I knew Mark from his local pub (Wellington) and he taught me a lot about bicycle maintenance. I remember turning up to the Wellington one evening cursing about my bike and how the gears/brakes weren’t working. I was going to dump the bike at the local dump and buy another one. Mark introduced himself to me and said he would have a look at it. He said there wasn’t really much wrong with it and said he could fix everything I was complaing about. He didn’t charge me very much money for fixing it but it came back as good as new. Now I think he got more of a kick out of explaining what he’d done and teaching me how to fix it myself in the future than the kick he got out of saving a serviceable Bike. It saved me the cost of a new bike and started a new friendship. He was definately a natural teacher and now I am largely independant of shop repairs etc. thanks to what he taught me about how bicycles work. I know he would have been very happy about the ride as there was lots of bike talk and swapping of cycle maintenence tips. It was a great community ride with everone helping each other out if you fell behind the pace. The pace wasn’t really that fast anyway but it was reassuring to know that there were other riders happy to help you out if you suffered a mechanical problem.